This clip is pretty incredible. It'll be hard to wait for the 2010 release of the new Ironman movie. Tags: cellphone video, Ironman 2 sneak peek, Ironman 2 video, Mickey Rourke, Robert Downey Jr. Many years ago, I interviewed Judith Guest, author of Ordinary People, for a piece in Writer's Digest magazine. I loved how her first novel started out as a short story with characters that she just couldn't put down. One thing she mentioned was that her publisher wanted to change the book's title, but she wouldn't hear of it. 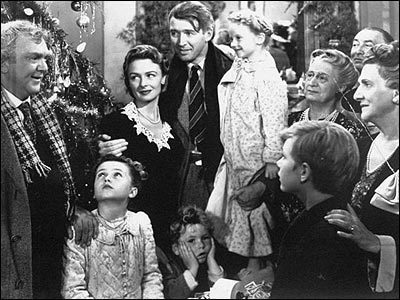 The concept of "ordinary" is a huge part of our favorite Christmas movie, It's a Wonderful Life. Told through vivid imagery and metaphor, this classic tale transcends time and technology. How does a b&w film from 1946, in the days before cgi, grab us year after year? For one thing, it's a heartfelt story that celebrates a hero who emerges from his ordinary life to accomplish something meaningful. With compelling characters and a pinch of quirkiness such as the squirrel running up Uncle Billy's shoulder, It's a Wonderful Life illustrates how accidents and unanticipated events bring out the best, or worst, in people. That's the way ordinary life works ... in 1946, in 2007 and beyond.